Mish's Global Economic Trend Analysis: Sure Thing?! Two things are happening. It's that easy sometimes. Either the economy is going to get better by itself, in the next 3 months and what assets are going to do well? You can guess what assets will do well - stocks are going to do well, bonds won't do so well, gold won't do as well. OR The economy is not going to pick up in the next three months and the Fed is going to come in with QE. Right? Then what's going to do well? Everything! In the near term - Everything! One might not be able to argue with Tepper's past performance, but one sure can argue with his current logic. Stocks do not necessarily go up because earnings go up. Stocks rise or fall primarily based on sentiment. Right now, sentiment is so bullish and earnings estimates so lofty there is room for hefty earnings expansion that falls short or estimates. Buying stocks that miss wildly optimistic earnings estimates is not likely to work out well. Furthermore, even if earnings do come in on target, there is no historic guarantee that stock prices follow. For example, on March 31, 1973 the S& P was at 111.52 with trailing earnings of $6.80. Seven years later, on March 31, 1980 the S&P was at 102.09 with trailing earnings of $15.27. Thus, over a span of seven years, earning rose 125% while stock prices fell 8.5%! What happened? The PE ratio on the S&P fell from 16.40 to 6.68, that's what. Moreover, those were real earnings then. Now, corporations hide garbage in SIVs with the blessing of the Fed and analysts cite pro-forma earnings that throw out "one-time" charges that occur with increasing regularity. Thus, anyone who says stock prices will go up because earnings go up, does not understand history. This does not make Tepper wrong, but it does make his argument fallacious. Tepper also argues that everything will be good if the Fed falls back on quantitative easing. Really? After a series of fairly ineffectual policy actions, the Bank of Japan undertook its famous quantitative easing policy from March 19, 2001, to March 9, 2006. Under this policy, the Bank shifted its day–to–day operating target from the overnight, call–money rate to the level of current–account balances (reserves) at banks. 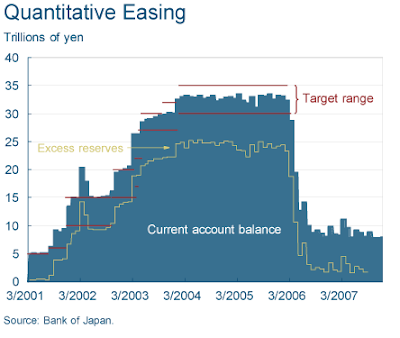 Over the five years that the program was in place, the Bank of Japan raised its current–account target nine times. In implementing the quantitative easing policy, the Bank of Japan also increased its outright purchases of longer-dated Japanese government securities. The objective was to flood banks with excess reserves, which, of course, would keep the call-money rate at zero. Although deflation ended in 2006, along with the quantitative easing policy, it returned after a very short hiatus in 2007, and continued until the recent commodity price boom. For the Japanese Nikkei Index it has been two lost decades going on three. Japan started QE on March 19, 2001. The stock market fell for two more years before staging a magnificent rally that collapsed to a new all time low in the great recession. 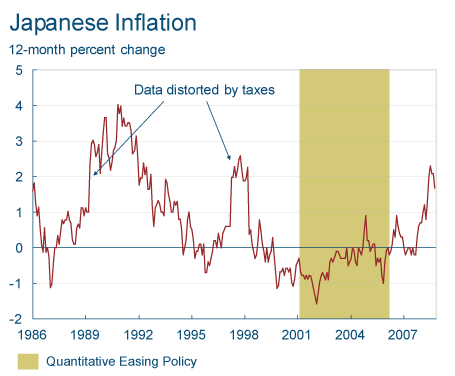 Amazingly, the Cleveland Fed article concludes "The Japanese experience suggests that when inflation and short–term interest rates approach zero, central banks should act aggressively, giving greater than normal weight to downside risks. Moreover, they should commit to an inflation target and clearly explain their actions in terms of that target." That nonsense was written in 2008. It is still nonsense today. Yet it seems to be the nonsense the Fed is about to try. Amazingly, nearly everyone believes it will work. If quantitative easing worked, we sure would not need another round of it. Would we? However, here were are with unemployment close to 10% (and I believe new all time highs are coming). Here we are with treasury yields in the gutter and with mortgage rates at all time lows, yet home sales are at record lows. To top it off, and in spite of trillions of dollars of Keynesian stimulus from Congress, on top of trillions of quantitative easing from the Fed, and GDP is likely to go negative this quarter or next! Indeed, quantitative easing was so much of a success that Bernanke needs to do it again. The Greatest Head-Fake of All-Time? Todd Harrison, founder of Minyanville is pondering the question The Greatest Market Head-Fake of All-Time? One of the first adages I learned on Wall Street was that nobody is bigger than the market. That theory is being put to the test. "Don't fight the Fed" has been taken to an entirely new level. It's no longer about rate cuts -- that bullet blasted long ago -- it's about massive "intervention,” intricate acronyms, and the full faith and credibility of our government. For those who point to the past -- The Depression, the 70's, Y2K -- I would offer that this time is indeed different. Never before has the world been so interconnected and leveraged. FDR didn’t know what a derivative was. I've said it before and I'll say it again, I want to see an economic recovery as I stand to benefit as much as the next guy. Despite what we hear -- the recession is over, the upside is easy -- let me tell you something you already know: it's not easy and it ain't over. I consider myself an optimistic realist, meaning I hope for the best but will call it like I see it. Before we put the final toe tag on the legacy of this Great Recession, I foresee more pain, perhaps a lot of it. There are drugs that mask the symptoms and medicine that cures the disease. The drugs -- giving the drunk another drink with hopes he sobers up -- will carry us for only so long before social mood sours to the point of deterioration either domestically, internationally, or both. The medicine -- debt destruction or reorganization -- would be a bitter pill for asset classes but a strong step towards true globalization. The government bought time, literally, by reflating markets and allowing corporate America to roll out debt and issue stock. Risk wasn't destroyed, it simply changed shape. It migrated from one perception to another, from one balance sheet to the next. I don't know how to be any clearer; we can run but we cannot indefinitely hide. Sometimes I feel like I'm taking crazy pills. The imbalances are cumulative still and the lessons learned from the previous crisis have been squandered. Could we rally in the intermediate term? Sure, just as nobody is bigger than the market, nobody is smarter than it either... least of all me. I respect David Tepper -- his track record and the attendant compensation are eye-poppers -- but would caution Minyans that if a trade looks too easy, it probably is. Could We Be Missing Something? Last week, right after this Tepper story appeared, I was asked by a fund manager I highly respect "Could we be missing something?" It's always possible to miss something. In spite of what I think the next Congress will do (be far more conservative), perhaps I am wrong. Perhaps Congress starts sending checks, the dollar drops and stocks soar. It's quite a long shot, but it could happen, at least in theory. Can it be that the real economy just does not matter? I don’t think so, but can it not matter for longer than we thought? Perhaps the market is going up for reasons none of us can see, even the bulls. Perhaps the market rolled 6 straight (4’s, 5’s, 9’s, and 10’s) with no 7’s. The odds are against it, but it can happen. Long shots do come in from time to time. Indeed long-shots must, by definition pay off at times. Otherwise they would be zero-shots not long-shots. Judging from the technical action, I believe there is an increasing chance we have one more swoon down to say 900, with the market going sideways then for 5 years. There is also an increasing chance we do not have another collapse, just a slow drift down for a long time similar to what happened in the 1970's. If either of those scenarios plays out, valuations can catch up with share prices. The result will not be pretty, and such a path would crucify pension plans and frustrate the heck out of bulls and bears alike. Arguably that is the path of maximum frustration. No one would be happy. Finally, there is always a chance we did not miss anything major and the simple explanation is that there are (or at least were) far too many bears. Indeed, that may be the most likely explanation. After all, the arguments presented by the bulls are fatally flawed. Yet flawed or not, if most of the key players acted on those beliefs, the market was at least bound to rise temporarily on those misguided beliefs. The costs of QE 2 in our view however go beyond the cost benefit analysis Chairman Bernanke highlighted in his Jackson Hole speech. There, the Chairman highlighted two key risks to additional purchases of longer-term securities. First, that they do not know with precision the effect of changes in Fed holdings of securities on financial conditions. On this point we have emphasized on numerous occasions that the main consequences of QE1 to date have been financial asset inflation. Further purchases under QE2 hence in our view would likely be limited in impact to furthering this process of asset inflation. The second risk highlighted in Jackson Hole by the Chairman concerns the confidence effects of Fed’s ability to exit accommodative policy and shrink the size of its balance sheet. Bernanke acknowledged that fiscal policy needs to be part of the policy response and that “Central bankers alone cannot solve the world’s economic problems.” In our assessment, further liquidity injection beyond some additional marginal transmission mechanism into mortgage refinancing or housing affordability would achieve little impact on the real economy. For smaller corporates or small business, QE1 did little to expand lending, though QE1 likely did prevent even further declines in lending. However, QE alone appears incapable of leading to expanding lending as the problems today shift from one of supply to one of demand. Even as banks have eased underwriting standards, the demand for loans remains low. And this leads to our final cost analysis on QE2. Where confidence stands as the key issue for the economy, expanding QE2 may end up doing more damage than good as the confidence loss from a Fed indicating its fears of deflation through expansion of QE2 as well as the follow on loss of confidence from the diminishing impact of further QE leads to a loss in confidence whose costs outweigh those of the benefits of further reductions in long term rates. Tepper seems to have more confidence in Bernanke than Bernanke has in Bernanke. Even Bernanke seems to understand we are in uncharted territory with uncharted risks. One such risk is that confidence could severely erode in financial assets (such as equities) denominated in dollars and unsupported by Fed buying. That risk is both significant and heavily skewed to the downside. After all, equities are subject to earnings shock and PE compression, as noted earlier. Also note that the lift in equities in 2009 was a directly related to the lift in corporate bonds. Arguably, Bernanke's one success was unlocking the corporate bond market. Companies priced for bankruptcy on expectation they would not be able to roll over their debt got a new lease on life. Now junk bonds are back at par. So where to from here? At best, QE2 can maintain that liquidity. At worst, confidence collapses in spite of, or perhaps because of QE2. Conversely, commodities, especially gold, may be beneficiaries of a loss of confidence in equities, junk bonds, or the dollar. Thus, from a risk/reward perspective, stocks are quite far down on the list of places to be, hoping for QE2. A month ago everyone was focused on a "Hindenburg Omen". Now everyone is focused on a "sure thing" by the Fed. That is how quickly sentiment can change, and sentiment can just as easily turn again. Caution, not "sure things" seems like a better bet to me.